Tianma NLT USA has introduced a prototype of a new 30-inch diagonal, wide format, amorphous silicon thin film transistor (TFT) liquid crystal display (LCD) module, developed by NLT Technologies, Ltd., with a resolution of 3280 x 2048 pixels (6 megapixels, or 6MP). 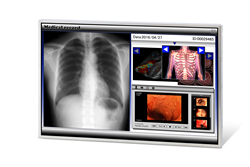 The new 30-inch wide LCD has a resolution of 6 megapixels, making it ideal for medical diagnostic applications. Due to the display’s high resolution and image quality, it is possible to display twice the amount of information on a single display as compared to NLT’s 21.3-inch 3 megapixel LCDs. This is the first 30-inch, 6MP color, active matrix LCD module developed by NLT. Due to the display’s high resolution and image quality, it is possible to display twice the amount of information on a single display as compared to NLT’s 21.3-inch 3 megapixel LCDs. Since graphic data and images are displayed more efficiently, the 30-inch 6MP display is well suited for next generation medical diagnostic applications. The prototype incorporates NLT’s new Super Fine TFT 2 (SFT2) technology (similar to In Plane Switching technology), which improves contrast ratio approximately 30% compared to NLT’s conventional SFT technology used in current 21.3-inch displays. SFT is NLT’s proprietary wide viewing angle technology and SFT2 represents the latest development in this technology, which improves the aperture ratio via a newly developed pixel structure, resulting in both high density and excellent optical performance, yielding wide viewing angles, wide color gamut and high transmissivity, while keeping power consumption low. Samples of the new 30-inch 6MP model are scheduled to be available in August 2016, and mass production is planned for early 2017. Tianma NLT USA has been established to be the leading provider of small to medium size display solutions to the Americas utilizing cutting edge technologies from Tianma Micro-electronics and NLT Technologies Ltd., coupled with the manufacturing resources of the Tianma Group. Applications include smartphones, tablet PCs, industrial and medical instrumentation, wearables, home automation, household appliances, office equipment, and automotive and rear seat entertainment devices, as well as test and measurement systems, instrumentation equipment, point-of-sale and ATM systems, gaming systems, global positioning systems, radio-frequency identification devices and barcode scanners. Technologies include TFT, LTPS-TFT, Oxide-TFT, AM-OLED, flexible, transparent, 3D, PCAP and In-cell/On-cell integrated touch technology. With a network of best-in-class distributors and value-added partners, Tianma NLT USA provides complete display module solutions for a broad base of customers and applications. The range of display features offered includes ultra-high resolutions, wide temperature ranges, high contrast ratios, rich color gamut, backward compatibility, LED backlights, high bright and transflective viewing for use in diverse lighting environments.